Join us for a series of events around the arts exchanges with the Kuikuro indigenous people of Xingu, as part of Tate Exchange week ‘Producing Memory: maps, materials, belongings’, with artists and researchers from Queen Mary University of London, from 1 to 6 May. Enter our oca and embark on a journey to the Ipatse Village, home of the Kuikuro indigenous people in the Xingu region of Brazil. See photographs and listen to ambisonic sound recordings of the community’s daily life and traditions, and watch a video fly-through of scan data from around the Ipatse village, produced by Factum Foundation. A documentary directed by Takumã Kuikuro, a filmmaker from the Brazilian Xingu territory, and produced by People’s Palace Projects. The film draws on Takumã’s month-long residency in London in 2015 and reflects his experience of the metropolis through the lens of an indigenous way of life. Screenings at 12.30pm and 3pm. The Xingu is a protected area of more than 2.6 million hectares in the Brazilian Amazon region and home to 16 indigenous peoples, including the Kuikuro. Through the creation of an artistic residency centre in their village last year, the Kuikuro are exploring new ways in which indigenous peoples can bring the evolving experiences of first millennial life to contemporary debates about Brazilian economic and social development in the third millennium. With Paul Heritage (Artistic Director, People’s Palace Projects, and Professor of Drama and Performance, QMUL), Prof. Jerry Brotton (Renaissance Studies, QMUL), Leandro Valiati, one of Brazil’s leading cultural economists and Visiting Professor in the Economy of Culture at Queen Mary, and Yamalui Kuikuro (Indigenous Researcher, Xingu Indigenous Territory). Try out the virtual reality experience developed by creative coder Clelio de Paula, inspired by his journey into the indigenous territory of Xingu. Photogrammetry is the science of making measurements from photographs. It is used for mapping the exact positions of surface points – for example, in cultural heritage research and preservation/replication of major artefacts. In this workshop, Factum Foundation´s work using this and other 3D imaging techniques in the Xingu will be discussed alongside a practical demonstration of how to generate a 3D model. From 10.30am-1pm. 15 places only, booking necessary. In May 2017, Takumã collaborated with Adam Lowe, British digital technology artist and director of Factum Foundation, and Jerry Brotton, a scholar in cartographic history at QMUL, in his village in the Xingu region of Brazil as part of an exchange programme curated by Heritage in partnership with AIKAX. The Xingu, Mato Grosso State, is a protected area of more than 2.6 million hectares and home to 16 indigenous peoples, including the Kuikuro. The artists and researchers worked together, using advanced digital technologies to enable the community of the Ipatse village, Takumã’s home, to create 3D maps of their territories and cultures. Takumã and Factum Foundation used a 3D Faro laser scanner to record vulnerable aspects of Kuikuro cultural heritage including images, sounds, graphics, artefacts and architecture. 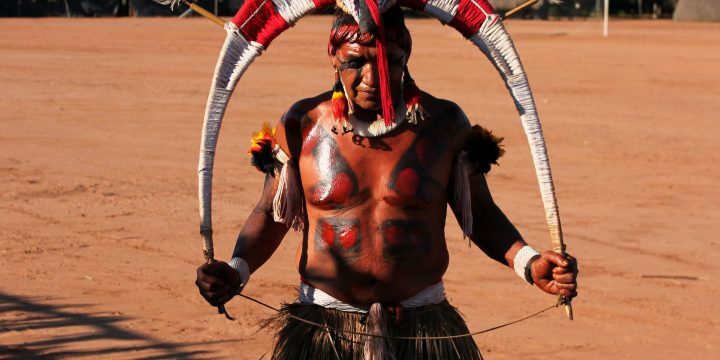 The project explored new ways in which indigenous peoples can bring the evolving experiences of first millennial life to contemporary debates about Brazilian economic and social development in the third millennium. London as a Village is a 22 minute documentary, directed by Takumã and produced by People’s Palace Projects with support from Brazil’s Ministry of Culture. It draws on his month-long residency in London. Two phases of the Xingu research exchange in 2017 were funded by the Arts and Humanities Research Council, Newton Fund and Global Challenges Research Fund. PPP is core funded as a National Portfolio Organisation of Arts Council England and by QMUL. This event is programmed by Queen Mary University London, a Tate Exchange Associate.